After some brief introductions and a detailed overview of the agenda, expert instructors Andy Wigley and Rob Tiffany kick off the course with an information-packed introduction. 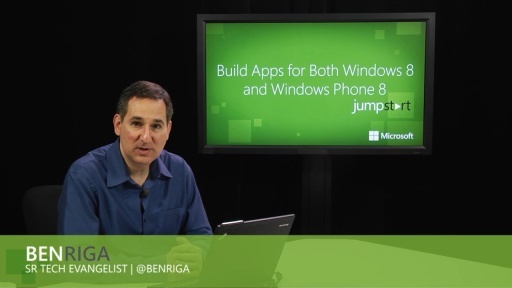 This is the first part of a two-part module and covers the new app platform in Windows Phone 8, application development models, the Windows Phone 8 version of WinRT, supported application models and a "getting started with WP8 app development" section. I would really appreciate if you guys added captions to your videos. I am deaf and I have so many ideas for apps and I would definitely be interested in developing for Windows Phone 8 if I could only understand what anybody is saying. Reading lips can only go so far. Awesome! Thanks MS!! .. and C9! Following the Day 2, couldn't wait for the full session to upload! Is there a Channel 9 Windows 8 downloadable app to watch this kind of training? 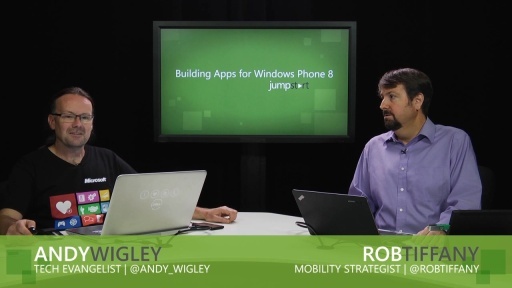 Fantastic series to learn everthing around WP8! Great! Thanks MS! Any chance to get subs? It would be nice for non english speakers like me. Any chance to get the source code? You've mentioned that you'll publish them. There is a zip file link there for the code demos too but I'm personally having trouble extracting from it. Hoping it gets added here too. Great videos! Thank you very much! 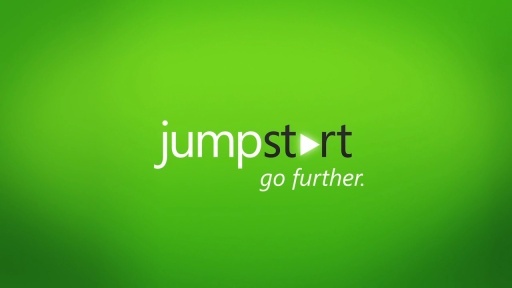 The Demo code download at the JumpStart site is broken. Unable to extract it as it asks for the next file in the split/spanned archive. I've downloaded both from Day 1 and Day 2 (exact same file size from both). Tried Windows Explorer, WinRAR and WinZip to extract. None worked. Please re-upload the demos. 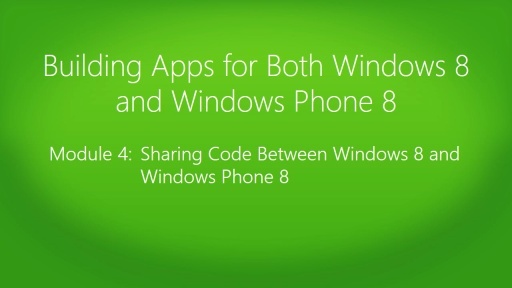 Is is possible to download the videos direct to a windows 8 phone for viewing. Does IE on windows phone 8 support right click and download. If not, how would you put one of the videos onto the phone /(Nokia 920) for offline viewing. Downloads are still broken. Anyone fixing them?? Is the source code available for these lessons? I would really like to see the code for the projects. Has anyone fixed the source code yet?? I would really like to download it. However, when I do download it what ever program I want to use says that it is in more than one file and I just keep getting errors and not even any partial extractions. PLEASE PLEASE PLEASE someone help us!!! I'm interested in where i can find the all of demos used in this series. it's really a shame this video does not contain subtitles. Do I need to know Windows phone 7 development prior to watching this session ? Is it for beginners ? amazing video , can I share it in my web site: www.apluswebdesign.ca ? I have enjoyed original set of sessions for WP 7.X you have presented as well as this new set. Great job! Now, I think that it is time for something like this to be done for Windows 8 (Windows Store Applications). Thanks a lot,but my English is very pool,can you add Chinese subtitles？Thank you! Also, is there a way to download all the videos for this series at once? do u have any idea on this error? thanks MS n C9 .. I would be very happy if these videos have subtitles in Spanish. Please.! Where we find the source code? Thank you for tutorials. Brillian! thanks Mr. Robs and Mr Andy,, for the nice intro. Am not a software developer but I was convenes when Mr Eduardo demosntrate the Windows 8 Apps during UAE Open Door in Abu Dhabi..Thnaks once again!!! 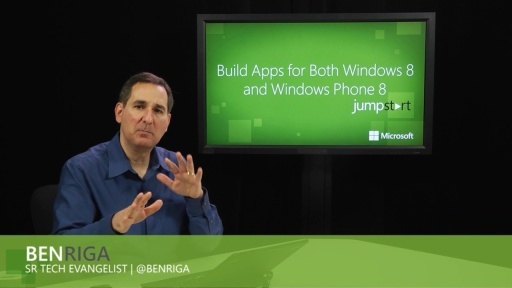 It would be good of we could have had a jumpstart video for playing with 3D on WP8. Any pointers? Thanks very much for these valuable lessons,though I'm not very good on English. Great. Thanx Guys. keep it up. is there a summary for this ? 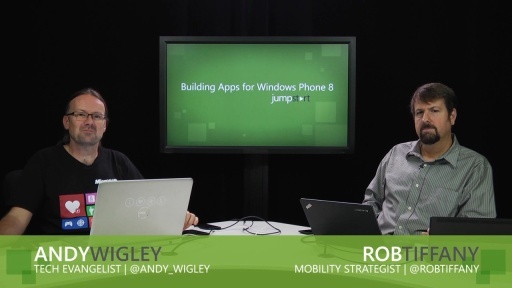 What is the laptop that Andy Wigley uses ?? Some Dell model ? I want to take some information about MCSD of windows 8 phone. and complete exams name. I want to learn how to create window mobile. Greate series. I really want to get the certification 599. Do i need pass 2 certifications silverlight before ??? Can i study window phone 8 directly without studying silverlight ??? Please set subtitle for all of the videos. Where could I get the Microsoft WP t-shirt? can you guys just stop waffling about yourselves and talk about what we came to lean. Lumia is a good boy! @linp: You are right Linp. Lumia is really very cool.